In response to direction from the Board of Supervisors in September 2014, amendments to the Non-Coastal Zoning Ordinance were prepared and adopted which added a new Dark Sky Overlay zone to the unincorporated areas within the Ojai Valley Municipal Advisory Council (MAC) jurisdiction in the Ojai Valley. To find out if your property lies within this overlay zone, please visit this link. Promote safe, energy-efficient and cost effective outdoor lighting. The proposed ordinance amendments were considered by the County Planning Commission at a public hearing held on Thursday, July 26, 2018. Thereafter, the proposed ordinance amendments were adopted by the Board of Supervisors on Tuesday, September 25, 2018. The requirements of this ordinance are effective November 1, 2018 for new lighting installed after that date. The ordinance includes limited applicability to existing lighting on properties, which will be effective November 1, 2019. No retrofits or replacements are required for existing lighting in residential, open space, agricultural or rural zones. Special requirements apply to existing lighting in commercial and industrial zones for commercial and industrial uses. These will go into effect in three years on November 1, 2021. Please refer to Section 8109-4.7.2 for more detailed information. An interactive Story Map to learn more about the adopted ordinance. An Informational brochure, which includes a two-page summary of the adopted ordinance. Frequently Asked Questions- Coming soon! Dark Sky Technical Terms, an informational brochure- Coming soon! For more information on dark sky policies nationwide, see the International Dark-Sky Association website. The following list is a chronological summary of the project, including several opportunities provided by the Planning Division for public input at various public meetings. November 1, 2018 – Effective date of the adopted Ojai Valley Dark Sky Ordinance. 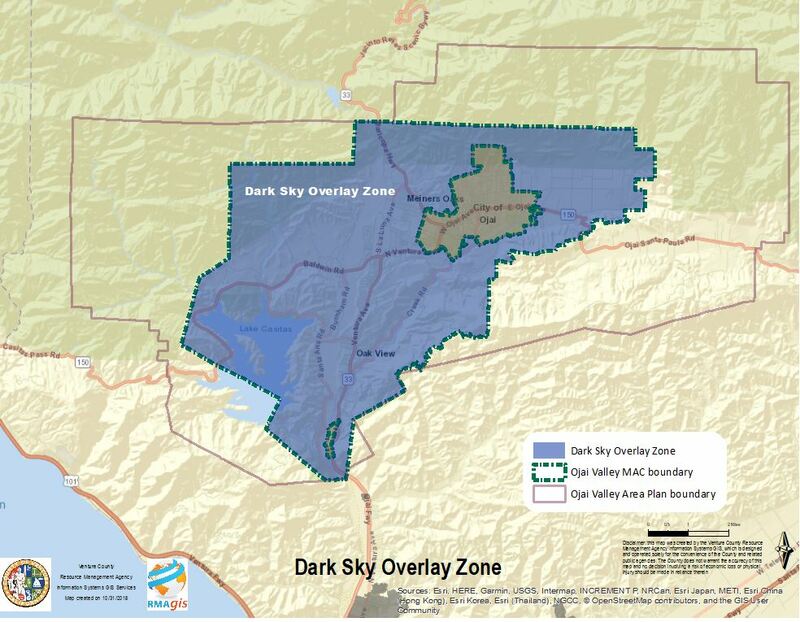 September 25, 2018 – The County Board of supervisors adopted proposed amendments to the Non-Coastal Zoning Ordinance to add a new Dark Sky Overlay Zone for the Ojai Valley MAC area. A video of the Board hearing is linked here (Item 40). July 26, 2018 – The Ventura County Planning Commission considered staff recommendations for the new Dark Sky Overlay Zone and recommended adoption of the proposed project, with direction for the Planning Division to address the following issues in the ordinance: (1) avoid the impairment of vested rights for existing commercial and industrial property owners; (2) consider the impact of requiring reduced lighting intensity and color on the effective operation of security cameras; and (3) eliminate the requirement for motion sensors on security lighting used for agricultural operations in agricultural zones. Materials prepared for this hearing are available here. July 16, 2018 – Planning staff presented the draft Ordinance at the Ojai Valley MAC meeting and received public comments and answered questions. The MAC members recommended approval of the draft ordinance with one major change requested. The MAC requested revisions to require existing lighting on commercial and industrial sites to be replaced consistent with the new standards within three years. 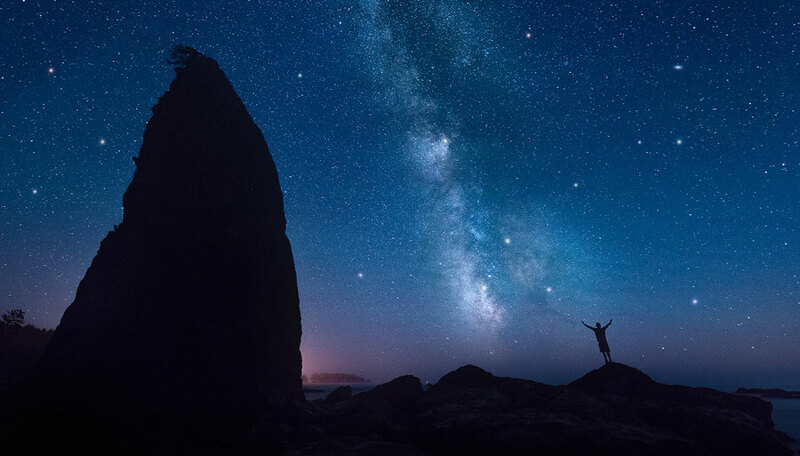 July 11, 2018 – Planning staff presented the draft Dark Sky Ordinance at the Agricultural Policy Advisory Committee (APAC) Meeting and received public comments. The APAC did not take any action during this meeting. April 23, 2018 – Planning staff presented the initial concepts for the Dark Sky Ordinance at the Ojai Valley MAC meeting and received public comments. October 2017 – Planning staff commenced work on the Ojai Valley Dark Sky project. September 16, 2014 - Board directed Planning Division staff to develop a Dark Sky Ordinance for the unincorporated areas located within the Ojai Valley MAC boundaries. This item was subsequently prioritized by the Board with other Planning Division work items and assigned a targeted completion date of mid-2018. A link to the Board hearing and Board Letter can be found here (Item 27). July 21, 2014 – The Ojai Valley MAC considered a new Dark Sky ordinance for the unincorporated Ojai Valley on a request from the Ojai Valley Green Coalition. The MAC recommended approval of this request.